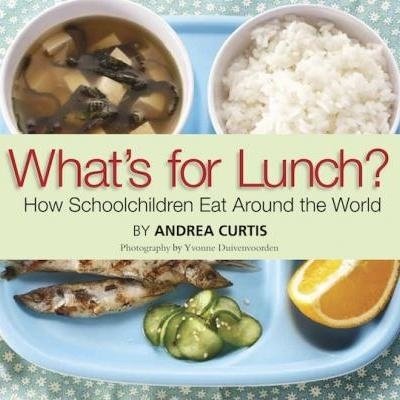 I received a great present in the mail today: this new book by Andrea Curtis on school lunches around the world. It struck a chord, obviously, given the blogging I’ve been doing for over a year on French school lunches. The book inspired many thoughts, not least of which was admiration for how some lower-income countries do a great job of feeding children well. And also a renewed sense of determination to keep working on children’s food issues here. The ‘typical’ lunch for Canadian and American kids was….well, let’s just say it didn’t make me particularly proud. We can do better! And our kids deserve better. Luckily the book also has some inspiring examples of great community projects that are changing things (including some primary school kids who are campaigning to change school lunches — talk about ‘bottom-up’ grassroots movements!). Andrea and I met last year in Toronto, and I was really inspired to hear about her work with local schools, and on local food issues. This is only one of her many fantastic projects. So check out her blog, which has some informative (and funny) posts on the process of writing the book, and lots of thoughts on food policy, food politics, and more. Oh, and there are some great tools for educators, too (under ‘learning resources’). Thank you, Andrea, for writing such a great book! We’ll spread the word! « Radishes and navy beans, pumpkins and garlic sausage….what French kids are eating for school lunch this week! Hi Monica – thanks for such a thoughtful comment! I agree: it does seem like an insurmountable challenge, but many people feel like you do, at least judging the many (and growing) blogs out there on healthy kids’ food. Some practical suggestions for convincing your private school. Share resources with them: like the ‘What’s for Lunch’ kids’ book just published by Andrea Curtis: http://unpackingschoollunch.wordpress.com. Or tell them about inspiring programs (like Chef Kate’s Cook for America, that teaches schools how to save money and improve meal quality by converting to scratch-cooking). Or, ask whether the kids could get involved — through creating a ‘cooking club’, or ‘food club’. If a small group of kids were interested from the outset, that could be a powerful catalyst for change across the school. Note: I realize this may not be much help, but I’m writing a new book (to be published in 2013) that addresses many of these issues head on, addressing the question: Why and how should we teach our children to eat well, and to love healthy food? Hope these suggestions are helpful: I would love to hear how it goes. Good luck! I am very grateful for your book and blog; how we feed our children, and our cultural attitude towards food, seem to be overwhelming issues, but your book and blog give me hope that maybe, just maybe, we can change things. Just last week I was discussing the problem of school lunches with a friend. We have both returned from having living in Suisse Romande (Geneva) for a number of years. The private school our children attended there followed a French-style lunch plan — a first course of vegetables or salad, a main course with a piece of baguette, a light dessert, cheese or yoghurt. In autumn, they ate game; fish was on the menu at least once a week; and besides beef, chicken and turkey (which is all lunch programs in Canada seem to offer), they offered lamb, emu, duck, pork and several kinds of fish — salmon, of course, but also trout, sole, and more exotic varieties with French names. Returning to Canada and facing lunch boxes, pizza days, and a commercial lunch program that offers little beyond mac’n’cheese, wraps, spaghetti, and maybe a chicken drumstick is depressing and frustrating. My kids won’t eat the commercial offerings, and so every day I pack a lunch with the feeling that I am failing them, because nothing that I pack them can equal the quality, variety, or nutritional and cultural value of what they were receiving in Geneva. And then this week, I found out from my 9 year old that they have only 15 minutes to eat lunch, which does not give them time to eat a meal, just to “shovel it in”. My kids often wind up finishing their lunches after school in supervision. My friend and I were wondering what we can do; we feel rather helpless in our respective school systems, as we would need to deal not only with school authorities, but other parents as well. It would mean a huge cultural change that would require the commitment of other parents, and since this is how everyone here eats, it seems insurmountable. As you write, meals are an important educational opportunity, but it seems to me we are teaching all the wrong things. It should be about imparting a love for a wide variety of flavours and textures, about the delight of conversations at the table, about appreciating each season’s bounty. All we teach is “sugar bad”, “eat fruits and vegetables” (unimaginatively prepared), and “avoid white, go for whole grain”. It heavy-handed and leads to a lifetime of guilt and terrible meals. It really is a great book – I’m thinking of buying one for our school principal as well as the library! Pictures say a thousand words…. I must read this book. I volunteered as a Lunch Monitor for the first time today at the girls’ school. I decided it was high time I stop assuming the food was bad (we pack our lunch), and see for myself. It was so much worse than I had imagined, which for a positive person, was hard to stomach. Literally. Beanie Weenies in a horrid sauce and a putrid looking veggie sludge. No one ate anything. Jello and chocolate milk and they tossed the rest. I’ve always kept my mouth shut and packed, but I’m going to have to say something. I think I saw a few veggies and the kids tossed them. HORRID. Thank you so much for sharing this awesome book!